I really should know better. For the last few weeks I have been reading five million books at once, give or take a million. My usual method is to have two books going at once, one fiction and one nonfiction, but somehow I just kept starting books until it got completely out of hand. I spent quite a while binge reading a science fiction series that belongs to my son. I am not sure why, other than Lois McMaster Bujold I am not really a huge science fiction reader. However, a world of aliens, spacecraft, new worlds, and the occasional battle seems to have been just what I was in the mood for. Pure escapism. 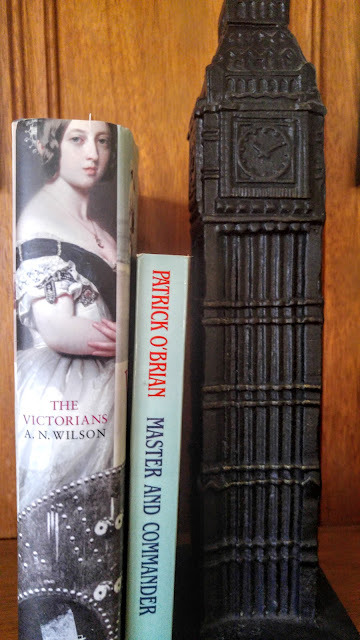 At the same time, I am reading The Victorians by A. N. Wilson. I know, could I possibly have picked anything more different? I read Victoria--A Life by the same author earlier this year and was fascinated by it. I am finding this one a bit heavier going since it is about a time period instead of an individual but it is still very interesting. I just read about the Irish potato famine. Absolutely horrifying. 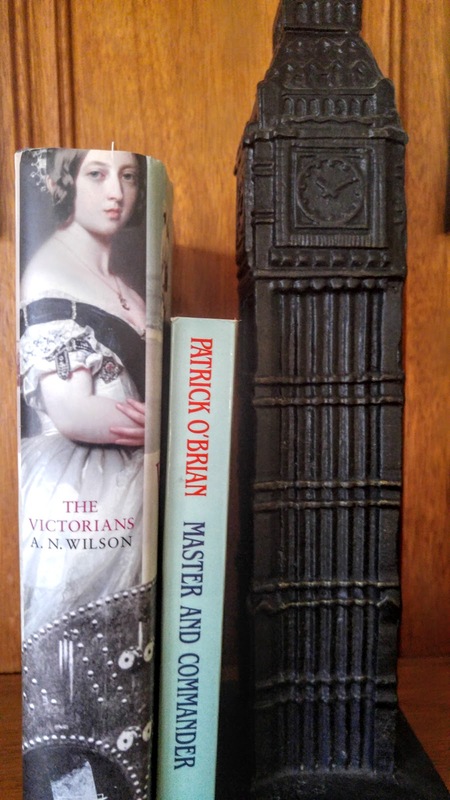 When I was raiding my son's bookshelves for science fiction I came across Master and Commander by Patrick O'Brian. He enjoyed it and wants me to pick up the rest of the series as I come across them. I also believe Hamlette from The Edge of the Precipice recommended them to me. I am about halfway through and my son says I am just reaching the good part. I must admit all the sailing jargon put me off a bit but I am persevering since the series is so beloved by many. These are the only two book I have bought recently and I am reading one of them. Lory at The Emerald City Book Review is co-hosting a read-along of Mayflower by Nathaniel Philbrick. She already posted the discussion questions for the week but since I am reading five million books at once I am a bit behind with this one. I am finding it absolutely fascinating though and keep inflicting interesting pieces of information on my family. Always a sign of a good book. 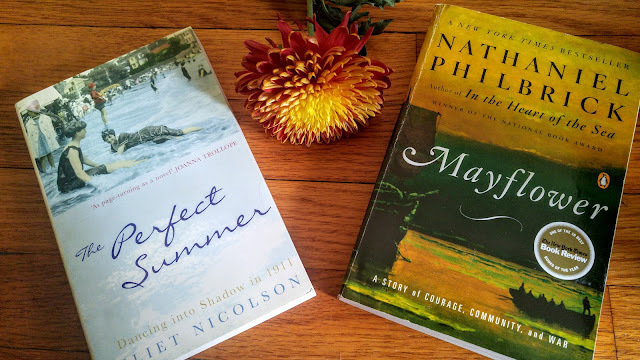 I read a review of The Perfect Summer on a blog somewhere and promptly bought it. Now I can't remember which blog it was. I need to start writing these things down. I am not letting myself start it until I finish a few other books. 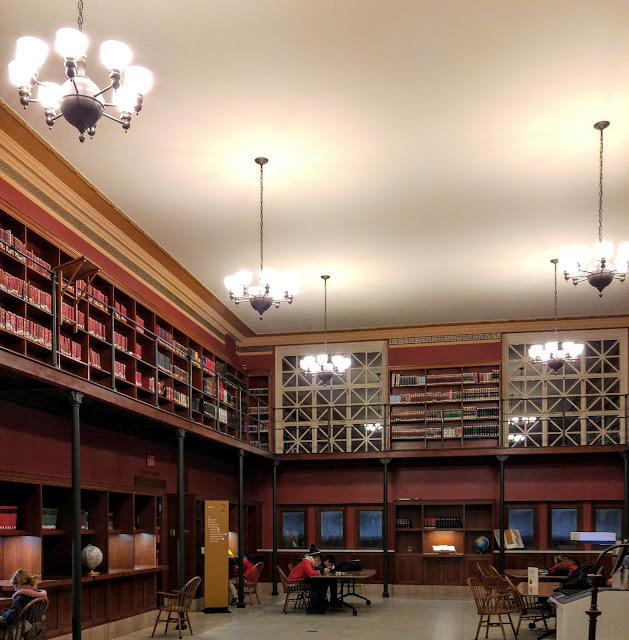 Do you read five million books at once? What have you been reading lately? I think I was just in the wrong mood for it. Possibly, reading too many books at once did not help. I still haven't returned it to the library so you never know, maybe I will pick it up again. I try to read only two books at once, but right now I've got four going, and two from the library waiting for me. And then I shoved those all aside and read two short books over the past couple days. Sometimes this just happens. I tend to let all the sailing jargon flow over me when reading Patrick O'Brian's books -- bits of it have stuck, but it's the characters I read that series for :-) As usual. I got along much better with Master and Commander once I started ignoring the sailing jargon. There are ships and sails and guns and that is all I need to know. I'll just let the rest pass me by and enjoy the story.